Ah, sage green, the color on the walls of every psychiatric ward and insane asylum. That is no coincidence. Hah, coin pun. Sorry, I had to. Anywho, it is scientifically proven that the color of sage green exerts a calming effect which shakes away uneasiness and creates a tranquil environment. Dont believe me?. This coin exhibits bright pumpkin orange encircling the rims and blends inwards into the aforementioned sage and celadon green with a light blue tintedness. 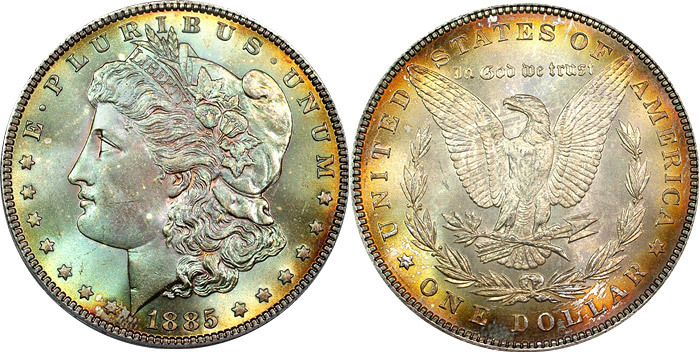 I think it is this blending of sage with a hint of icy blue tint that makes this coin such a pleasure to look at. This wonderful color makes its way up onto Libertys face and hair where it transitions into a pink-lavender in the recesses adding yet another level of intricate beauty to this outstadingly lovely coin. Maybe I just love toners too much but I cannot seem to put this beauty down. I think it might have something to do with my high-strung and anxiety ridden brain and the calming effect of the elegant and tranquil colors on this coin. It is honestly the most therapeutic coin I have ever had the pleasure of handling. I think I will make the picture of it my desktop wallpaper for the time being.